Things have been a bit slow around here lately on Phoresia but not without good reason. Ricardo recently welcomed his first son into this world so his priorities are changing as all parents tend to. On top of that we’ve both actually been surfing quite a bit the past few months and recently got to score our first surf session together since over a year ago. Funny enough our friend Burry got a few shots of us on one of our 2 sessions over the holidays. Photo at left is Slick-Rick riding my 5’10 quad and that’s me below on the 6’0″ bamboo rocketfish. 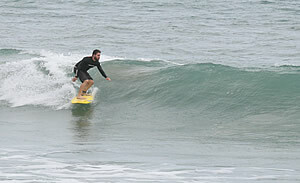 Fun times, good friends, family and warm water in December. Can’t much beat that. Honestly, we’re both kinda played out a bit on our original direction for Phoresia which was “sustainable surfing” – the products, lifestyles and thought processes that encompassed that. Not because we’ve lost interest or there is any lack of inspiring things going on, but nearly the opposite, in that exploring the concept in detail we’ve both kind of found our own happy stasis in life, surfing, family and overall environmental impact. At first, trying to lead a more sustainable life in regards to surfing and otherwise, seemed like it would be difficult and require great efforts. Quite the opposite has proven to be true. By eliminating all the unneeded excess it frees you up mentally, physically and monetarily to pursue the things that truly make you happy versus getting caught in the trappings of what you think you need to make you happy. We’ve come to realize being “sustainable” isn’t about the products you buy, it’s about the products you don’t buy. Here here. I’m sure you two can still come up with some worth content though, even if its not reviewing a wetsuit made out of old Hummer tires, donated by the ELF. Don’t let Phoresia die. You guys had the first professional looking surf blog and helped set the standard. Stay bloggy my friends.